Automated Guided Vehicles* are transforming manufacturing as production methods get SMART and we move into the 4th Industrial revolution. Industry 4.0 takes LEAN manufacturing into the next generation by using smart technology and real-time data to increase productivity, eliminate errors and reduce costs. Objects recognition technology can detect sensors embedded within workflow and storage systems, for example to guide standardized tasks correctly and alert workers when an error is made. Automated Guided Vehicles (AGV’s ) are the future for conveyance of objects around the workplace, as they are safer to use and integrate well with modern process driven solutions in many industry sectors, including; Aerospace, High Tech Manufacturing, Electrical engineering and the Automotive industry. *Automated Guided Vehicles (AGV) – A vehicle relying solely on automation referred to as robotic or autonomous. After the invention of the integrated circuit, the sophistication of automation technology has increased. Manufacturers have added a variety of automated functions to the workplace. ‘Factory of the Future’ innovators, Zodiac Aerospace (see Zodiac Aerospace case study) have embraced the 4th Industrial Revolution by upgrading systems with automatic processes and workflows. The introduction of AGV solutions, each with different tasks, provide shooter carts and deposit and transfer systems for four very different scenarios. The flexibility of the AGV system is critical to the production units layout, as movement is guaranteed by ribbons fixed to the floor. This ensures unsurpassed flexibility in terms of the routing configuration and the changes to paths. The Trilogiq AGV system is extremely flexible within the production area and answers the need for automatic transport without a driver. One of the latest applications installed by our AGV Team, has solved the problems of handling finished products for another of our customers, by designing a system that responds to a remote call from line operators. The AGV leaves the unloading bay to arrive at the workstation where the finished product is ready to be packed and shipped to the final customer. 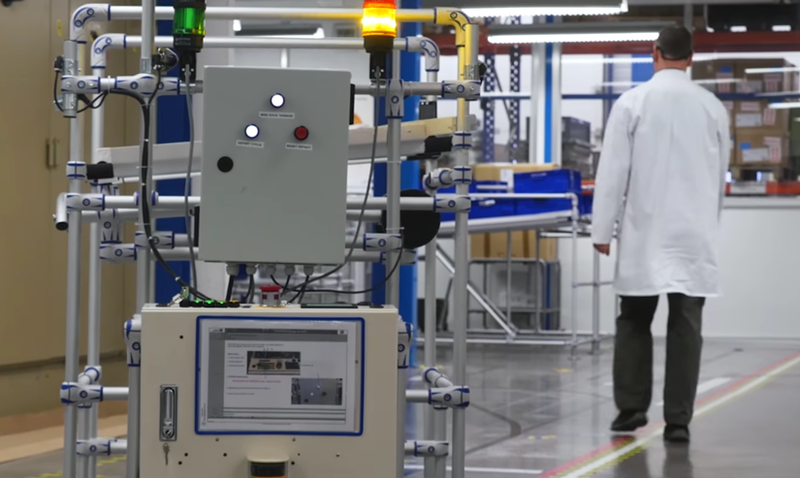 The implementation of an automatic gripping “Pin-Hook” system, adds the capacity for the AGV to transport pallets with the finished product, to the unloading and packaging bays and then be available for the next mission. The AGV system uses a double motor, so as to ensure the movements of two-way traffic, using only one path, which has benefited our customer by reducing installation and maintenance costs. Production methods are getting SMART with the introduction of AGV’s, Object Recognition Systems and Pick to Light technology. Transport, machinery, storage and production systems are capable of carrying out complex tasks in the smart factory, meaning that workers will benefit with ergonomic improvements and safer environments as heavy, repetitive or difficult tasks are guided or taken over entirely by automated systems. The First industrial Revolution – 18th to 19th centuries in Europe and America when Steam power took a central role. The second – 1870 and 1914. Major technological advances included the telephone, light bulb, and phonograph made possible by electricity, combustion engines and new energy sources. The third – 1970s and 1980s with advancement in technology from analog electronic and mechanical devices to the digital technology and the digital era. The fourth industrial revolution; Industry 4.0. New technologies are embedded within societies and even the human body, fusing the physical, digital and biological worlds. Emerging technology breakthroughs in a number of fields, including robotics, artificial intelligence, nanotechnology, quantum computing, biotechnology, 3D printing and autonomous vehicles. Our expertise extends to designing and supplying the complete cart solution to deliver parts and assemblies across customer sites by AGV. For those customers that require full project management Trilogiq USA work alongside specialized vendors who supply and install AGV units. The Trilogiq solution is also trusted for the total integration of supporting flow racks and work cells to ensure efficient flow, standardization, and flexibility. Contact us for more information on AGV integrated solutions for your ‘Factory of the Future’ project.